Die cast housing. Durable housing is virtually indestructible, lightweight and exceptionally airtight. 360-degree caster wheels. Rotating caster wheels provide easy maneuverability and are made of non-marring thermoplastic rubber to prevent marks on the floor. Unique bumper design. 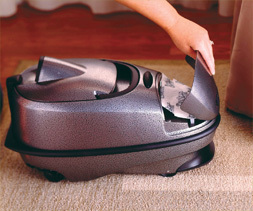 Specially designed bumper allows the cleaner to rest on end as well as protect walls and furniture. Top-mounted power switch. The on/off switch is operated with a simple foot tap. Powerful motor. 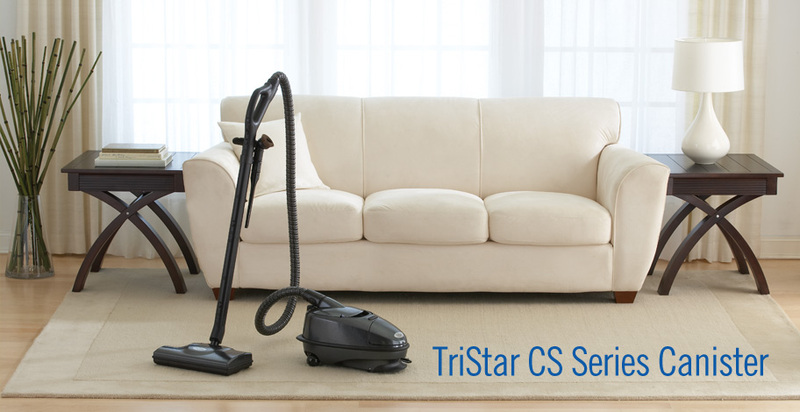 A special, dynamic fan provides powerful suction for all cleaning needs. Ergonomically-designed carry handle. Nylon handle is engineered to provide balanced weight distribution and easy transport. L-shaped power brush. The power brush maneuvers easily around chair and table legs and automatically adjusts height for different types of carpets. Gear-driven belt. 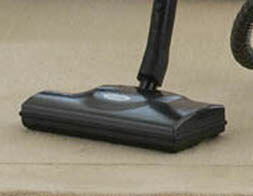 Special design reduces or eliminates slippage or breakage. Automatic shut off. Circuit breaker automatically shuts off and prevents damage to the motor if large objects become entangled in the power brush. Power switch. A switch conveniently located on the hose handle provides easy transition between carpet and bare floors. One-touch locking wands. Simple, convenient button securely fastens wands together. Handle locking mechanism. A lock prevents the handle from falling over when not in use.